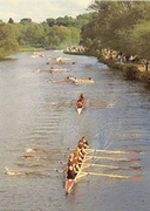 Since 1946 the Leiden-Oxford Committee has organised several sports exchanges with much enthusiasm. In the post war years, these sport exchanges offered the exceptional opportunity to spend some time abroad. The set-up of the exchanges has not changed over the years: from organisation to organisation, from club to club, from men to men. And even though going abroad has become more and more common these days, this formula still proves to be very valuable. Therefor, the exchanges are no longer being restricted to only sportdmen; from beekeepers to music companies and stamp collectors, everything is possible. Dozens of friendships and even marriages have come from the exchanges. The "Leiden-Oxford Committee" aims to build and increase cultural exchanges between the two cities. The Municipality of Leiden also helps in the development of the city link; regular contacts are established between the local authorities of both cities and officials are encouraged to exchange their knowledge and experiences. What could this city link do for you? The city link provides the opportunity to learn more about the great British society with its rich past and a unique piece of the English landscape.